Hofstra Student Life: This Weekend on campus! Welcome back to the Spring Semester! Debating what to do on a Friday night? Want to stay on campus, but do something fun and exciting? Student Leadership & Activities hosts PrideAfter Dark: First Fridays, a series of events on Friday nights held in HofUSA from 7-9 p.m.! The "first Friday" of every month, we invite students to join us to enjoy unique events, such as painting, no-bake desserts, Olympic-style games, acapella and open mic nights, etc. 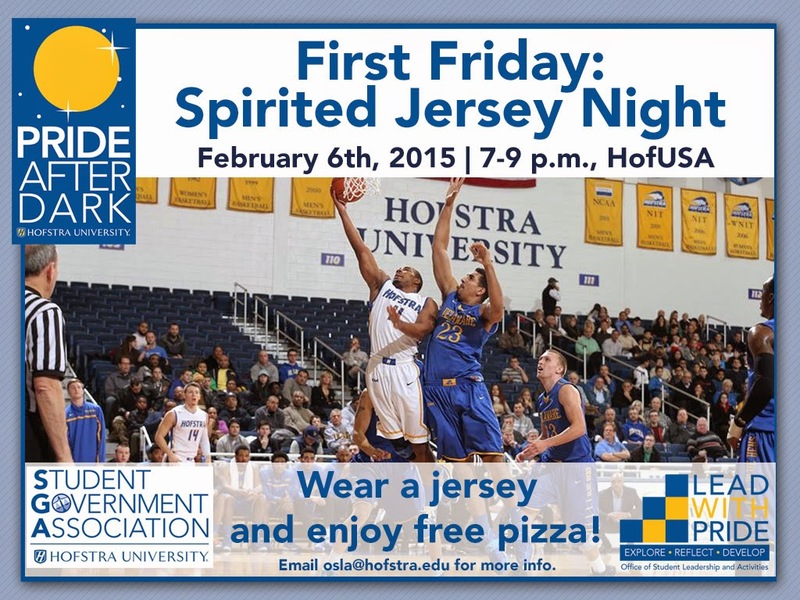 This month, February 6th, join SGA Spirit and OSLA in a 'Spirited Jersey Night' with free pizza! Wear a jersey, enjoy a bite to eat, and mingle with the members of your Student Government Association. Save the date! March 6th from 7-9 p.m. will be a very exciting Paint Night! Hosted by a studio in Huntington, 50 lucky students will be able to watch a demonstration of a painting and paint their own masterpiece with provided canvas and paints. More information to come- visit HERE for more info! Souperbowl: Come in from the cold and enjoy hot soup, chili, and wings while watching a much anticipated Football game at Student Leadership & Activities annual SOUPerbowl Viewing Party! The festivities start Sunday, February 1st, 2015 at 6 p.m. in HofUSA Lower Level. Members of the SGA Programming Board and Resident Student Association will be around to hang out, get pumped to support your favorite team, enjoy some favorite party food, and provide opportunities to win cool prizes at quarters and half-time! Kate and Willie may even make an appearance... Even if you don't like football, or are fans of another team who didn't make it to the Superbowl this year, join us for some free food, prizes, and to watch the exciting Half-Time Show on the big screen. 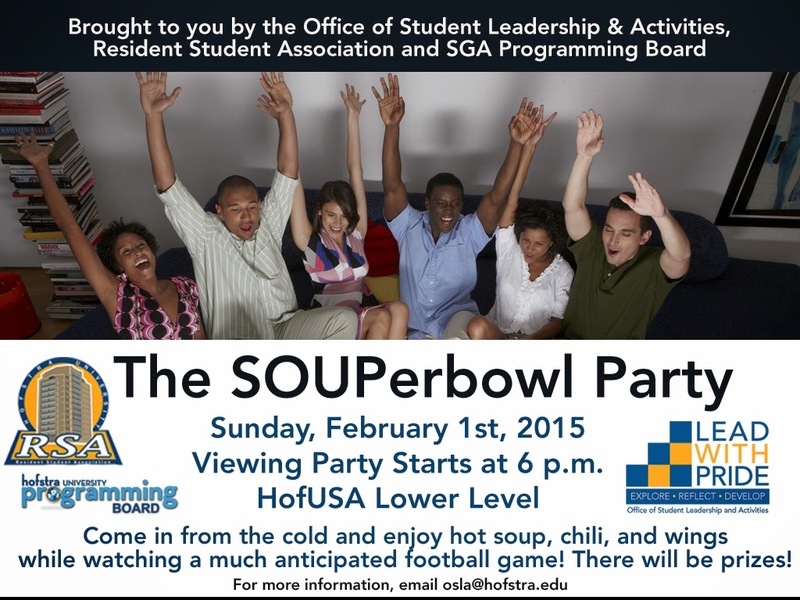 For more information, email osla@hofstra.edu.